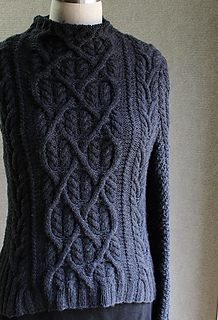 Sometimes knitting a sweater is like reading a good book. 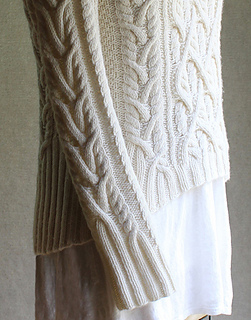 Each piece is an act and the stitch patterns are the characters. We get to know them in one chapter, we watch as they develop in another, we notice how they interact. Another act brings in new characters, reintroduces familiar ones. The plot thickens, parallels are made, everything comes together at last. Very satisfying. 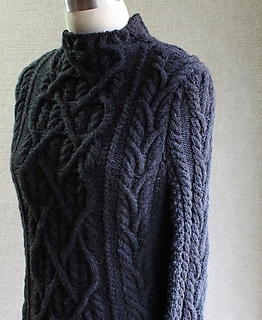 I’m sorry to be finished … perhaps I’ll knit another! Shakespeare in Love is just such a sweater. 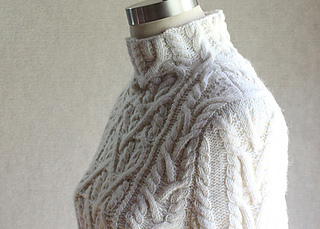 It has sumptuous cabling, a high neck and slender sleeves. 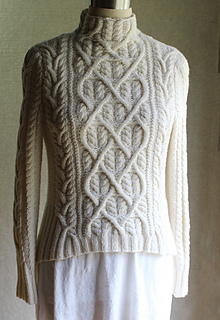 It is knitted from the bottom in pieces and seamed, although it could easily be worked in one piece to the underarms, eliminating selvedge stitches. 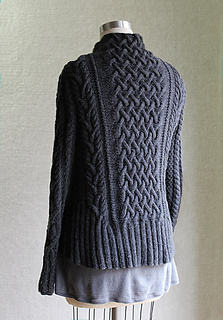 The latticed back has an (optionally) lowered hemline. Wrist ribs flow seamlessly into a cable that is a scaled-up version of front and back side panels. 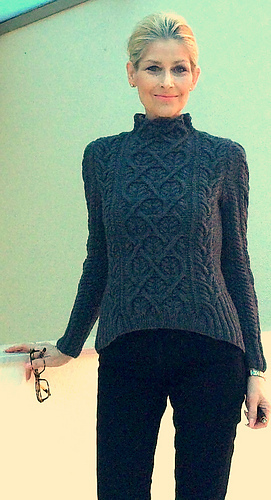 The cozy high neck is worked in the round as a continuation of front and back. 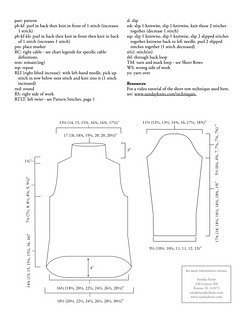 Sizes: Finished sweater chest sizes 32 (36, 40, 44, 48, 52, 56)“. 1-4” ease recommended. Shown in size 36 in winter white and in size 40 in charcoal - both on a 36” dress form. Yarn: 10 (12, 13, 15, 16, 18, 20) skeins Sunday Knits 5 ply (worsted weight yarn) in Eden (merino), Nirvana (merino cashmere), Brigadoon (merino tweed) or Angelic (merino angora). Needles & Notions: Needles size 7 US (4.5 mm) straight or circular needles for body and circular or double-pointed needles for neck; cable needle, tapestry needle, 6 markers, scrap yarn. 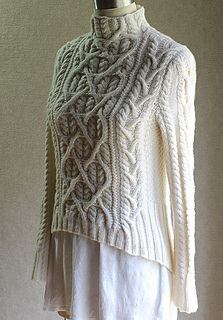 Techniques used: Cables, reading charts, short rows (explained), 3-needle bind off. 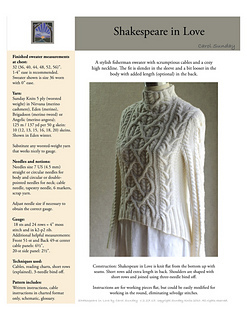 Pattern includes: Written instructions, cable instructions in charted format only, schematic, glossary. 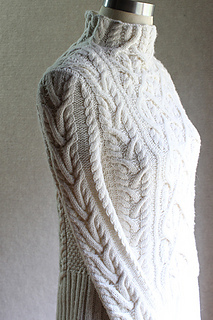 Ce modèle est disponible en français chez Annette Petavy Design.